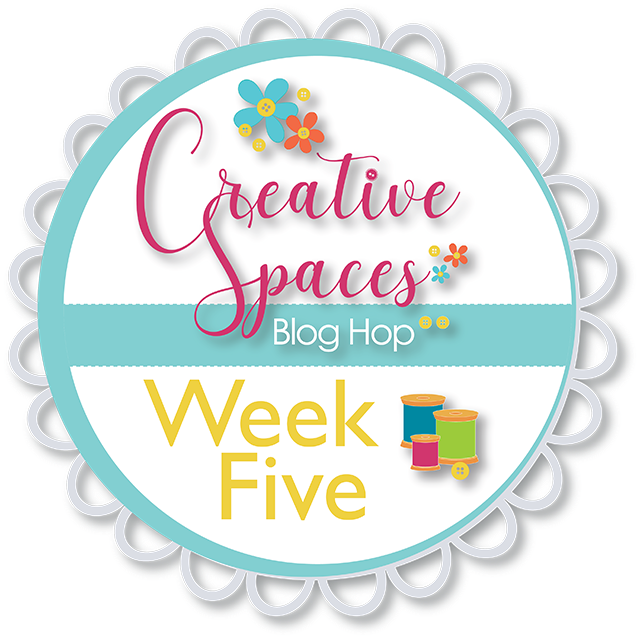 Morning Glory Designs: Creative Spaces Blog Hop Week 5 - Thread, Buttons, Embellishments Oh My! Creative Spaces Blog Hop Week 5 - Thread, Buttons, Embellishments Oh My! This week I will show you around my thread and buttons and odd stuff storage. The first stop is thread storage. Let me begin by saying I love thread! I keep all my cotton thread on spool racks on my sewing table where I can reach them in a hurry. I use Superior Masterpiece 50 wt thread for most piecing and machine applique work (spools on the right). I also use Connecting Threads Essential threads. I find they come in many more colors which I need for machine applique and they are a sturdy cotton 50 wt 3 ply long staple cotton. I don't use them for hand sewing, however, as the twist is not as tight as Masterpiece thread, and it tends to wind up and knot faster when whipping down binding. In the drawers beneath the sewing table I store polyester and rayon thread for machine embroidery. In the next drawer down is Wonder Fil thread in several weights. I LOVE LOVE LOVE using InvisiFil 100 wt for machine applique. It is my new go-to applique thread. I don't need a wide range of colors like I do with cotton, as this thread blends into everything. I also use Wonder Fil Deco Bob, an 80 wt bobbin thread. I can't say enough about this great thread for machine applique work. It is the best. Yes, I even like it better than Aurafil, which is a wonderful piecing thread. I also have a small tub filed with prewound bobbins. Yup, I love them in my 240 and my 440, but sadly they don't work in my Bernina 790. My serger sits on my sewing table so I also keep serger cone thread handy. I have basic colors stored in the plastic drawers which sit under my ironing board. On the other side of the room is a storage drawer with thread I don't use often. One box (the one on top) holds silk thread. I love to use this for machine applique, but have a very limited quantity of colors. The plastic containers keep it clean and dust free, and keeps moisture out. I can grab the plastic tray and bring them all over to the machine when I am ready to use them. I keep a selection of 50 wt and 100 wt silk thread on hand. Beneath the silk thread is an Aurifil collection of 30's colors I use when work with reproduction fabrics. There is also a storage bin for rayon thread and extra spools of embroidery poly I don't use very often. Most are duplicates of spools I have in my other drawer. As for button storage, um, you can tell I am a bit low on buttons! Hahaha. I actually do have more, but they are in my vending bins with other items I sell when I have a booth. I have been downsizing my buttons for several years now and this is a good thing! This little clear jar has a spinner top with 6 compartments for buttons. I store them by color. Now you get to see the real me! This is my ribbon, elastic, and zipper drawer. Yes, it is all thrown in there in a jumble and I am fine with just closing the drawer and not thinking about it. I am a bit better with crochet thread and embroidery floss. Although, I also have bins with hand embroidery projects stored for a rainy day. Ok, I have a lot of bins with embroidery projects store, and some Block of the Month kits, and some themed fabric, and. . . . . So that is the tour of my thread, button, and embellishment storage. Hope you found a few ideas you can use. This week, I have a pack of Aurifil thread to give away. Leave a comment below to be entered to win. And as always! Thanks for stopping by. Be sure to visit the other designers on the hop to be inspired by their storage solutions and enter more giveaways. My thread collection is small so I am able to sort and store it in a few containers. The embellishments and buttons are stored in baggies and containers as well. I try to keep everything in closed containers so dust doesn't built up. Otherwise I'd be sneezing all the time! I have sewing machines in 2 different rooms (one is set up for quilting), so I have thread in different places as well. My quilting thread is contained in several baskets and I have other threads on hanging spool racks. Wow, your thread is organized so well - and you have a lot of it!! :) I long for a better way to store trims, elastic, and such like. I'm thinking I just need to realize they don't store well and just do the best I can. Thanks for sharing with us. That’s a lot of thread. And so well organized. Thanks so much for sharing your ideas!! I have thread stored in drawers by brand and weight, but I don't have near the amount of thread you do! Thank you for the ideas. I am really jealous of your thread collection! Mine looks paltry next to yours! I moved recently and gave away so much thread. Wish I had kept it when I see how it can be stored. Thank so much for being part of the blog hop and sharing your ideas. All I can say is WOW!! at the thread collection. Your thread collection is fabulous and the way you have them all organized is impressive. This blog hop has been a great source of ideas and I appreciate your contributions to our enjoyment. Holy cannoli, you sure do have a HUGE collection of thread! Love how you have it all organized. Nice thread collection. Do they get dusty being open? I have wanted to try a thread rack. I keep my thread in plastic boxes as it is so dusty here. I feel for the pioneer women, and what they had to put up with. Right now my thread is in a couple of drawers of a dresser I have in my sewing room, but I am going to build a real narrow shelf unit that will fit behind my door to store them all in. Since I have started machine embroidering I have gotten more thread. I have drawers in the dresser for small tools, zippers, trims and what-have-yous. Great inspiration for me to get my threads organized in a more convenient way. It's nice to see I am not the only one with drawers of threads! I have my Mom’s sewing machine cabinet with storage in the four doors for thread - it’s all Coats thread and I am using it. I also have Coats thread in my sewing machine cabinet. I have all my quilt machine thread stored close to the machine. I would love to win Aurifil thread and see how it sews. Hi Reeze, WOW your thread collection is great. Some on the thread brand I have not used so I enjoyed your explanation of each type of thread. I also have a large collection of thread - various types, as I do machine embroidery, serging, sewing & quilting. I bought 6 large 18" spinners (lazy susans, from Bed, Bath & Beyond) to put in 2 corner cabinets (with 3 shelves & glass fronts that do not face the window). In one cabinet is embroidery thread (a few rayons & polys on different shelves) & in the other, serger threads, separated by lights, medium & dark colors. They offer quick access by turning it to the thread I need, while keeping light & dust at bay... and they look pretty thru the glass. All my regular sewing & quilting threads are in little drawer units stored in my cube unit, where fabric cubes store art supplies, a variety of yarns & scraps of stabilizer/ fabric. My sewing room is always over-flowing, in spite of constantly organizing & needs thinning out. Mostly it would help if I just completed some of my WIPs!! I too have a large selection of thread, and for the longest time it was the bane of my existence because I love thread as much as I love fabric in fact I can't love one without loving the other because fabric is basically a huge sheet of thread that has beautiful designs stored in it. I also have a total of 5 not 6 machines, I have a serger, an embroidery machine, a long arm, and my Featherweight which I love and my Janome for bigger projects. I also crochet with Thread, and some yarn not much yarn though. I also do hand embroidery so I have a lot of floss as well. So anyway, I have tried many different forms of storing my thread and I continue to look for a better way all the time, My husband after many years of listening to me laminating about wishing for a better way to deal with my thread solved part of my problem. He built me a beautiful 9 or 10 drawer cabinet that is the perfect height to store the majority of my thread. The cabinet stands approximately 5 ft tall, and the drawers hold thread sitting up slightly larger than the aurifil spools. I actually can use it for my scissors, and small rulers and various other items. I am going to ask him to make me a matching one with slightly bigger drawers to hold all my long arm and serger spools next. I don't have many buttons so they to reside in one of the drawers in the cabinet. I do have beads that are also stored in the button drawer as I do use beads and rhinestones as well. Have a great day. I love the divided container you have your buttons in! Mine are in jars & baggies. Threads ate so pretty to look at, all the colors! I keep trying to organize things; it's always a work-in-progress but I do have a separate bin for different sewing threads - cotton, polyester and embroidery with a few little bags in there to keep the other kinds of thread I have. Wish I had wall space to get thread up there! I too keep "trying" to organize, some day. Thanks for the great tips. I have a lot of embroidery thread, most of is Floriani since I was taking the classes from his company. Thanks for sharing. You do have a lot of thread and I'm impressed that you have it so organized. What beautiful drawers you have! I have a small thread collection that fits in a clear plastic scrapbooking box. I'd love to have enough thread to require more organization! Thanks for the tips! I also have a clear glass jar for every bit of loose thread from trimmings and picked-out stitches (may as well get something out of the effort!. I use the loose threads in art quilts. WOW - you have ltos of thread!!! Mine is in plastic storage boxes! Love those bins! They are looking very organized, and you can choose whichever project suits your mood or fancy. Thanks for sharing your storage ideas.